Integrated Aeronautical Information Publications (IAIP) facilitates the States in communicating Aeronautical Information with the world pertaining to Aeronautical Regulations, States' Policies, Aeronautical Data, and Procedures to be followed during emergency situations etc. According to the provisions of ICAO Annex 15, it is mandatory for each State to publish an Integrated Aeronautical Information Package including an Aeronautical Information Publication (AIP). ADL-eAIP is a comprehensive package which allows the Aeronautical Information Sections of Civil and Military Aviation Authorities to meet their AIP requirements. ADL-eAIP uses a dedicated HTML generator, compliant with EUROCONTROL eAIP Specifications, to produce an electronic version of AIP, increasing the use of automation in AIS by promoting electronic versions to replace the current paper-based elements of the Integrated Aeronautical Information Package (IAIP). ADL-eAIP minimizes user’s efforts by automatically extracting the required information (data, aeronautical charts and texts), managing the production cycle and auto generating the final eAIP publication interface. ADL-eAIP allows the user to manage ICAO compliant AIPs as well as AIP Amendments, AIP Supplements, Aeronautical Information Circulars (AICs) and non ICAO publications. eAIP Amendments are generated by comparing the new eAIP with the previous published version, automatically updating the page's date, checklist and cover letters. ADL-eAIP provides all mandatory ICAO Publication Templates and also provides flexibility to accommodate user defined rules/procedures in order to publish the local provisions/mandates as per the States Policies. ADL-eAIP is a part of ADL's integrated suite of applications for Aeronautical Information Services and Management (AIS/AIM). This suite consists of a Central Aeronautical Database (ADL-IAIDb) and a set of tools for the production of AIS products and the management of static and dynamic data. The integrated nature of ADL's AIS/AIM solutions ensures full compliance with the ICAO mandates for data quality. 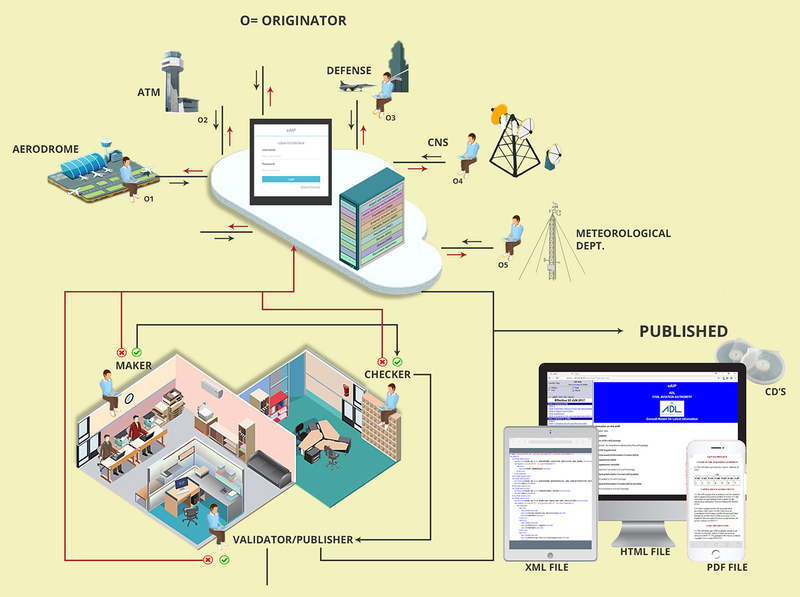 ADL-eAIP is a user friendly online application/ software that plugs into the State’s existing technology infrastructure and connects it with multiple..
..operators from remote locations to collate, validate and publish aeronautical data. ADL-eAIP application will work on all types of devices under all screen resolutions. Responsive websites re-organise themselves automatically according to the device viewing them, so that the same website provides a great experience everywhere. Desktops get a full-blown interface with videos, large images and animations. Smart phones get a simplified website that runs fast without the bells and whistles. Tablets and net books get something in between. ADL-eAIP application is a software developed on the concept of SaaS (Software as a service). During the deployment phase of the application, creation of the users is the most important task. Based on the each state’s Organisational hierarchy, ADL-eAIP allows same to be mapped to the system. Typically to sign in to the application one administrator is created and he/she has the authority to create new users. These users are typically in the format of originator,maker,checker,validator and publisher. The simplest and easy to use user profile creation allows administrator to add or remove or edit roles of existing and new users very effectively. One of the foremost aspects in implementation of any of the aeronautical system is for the data integrity. ADL-eAIP has developed its modules which can directly import your data from existing soft formats (eg: PDF, spread sheets or documents). This ensures that data received from the data originator is directly pushed into the eAIP modules and there is no data manipulation. 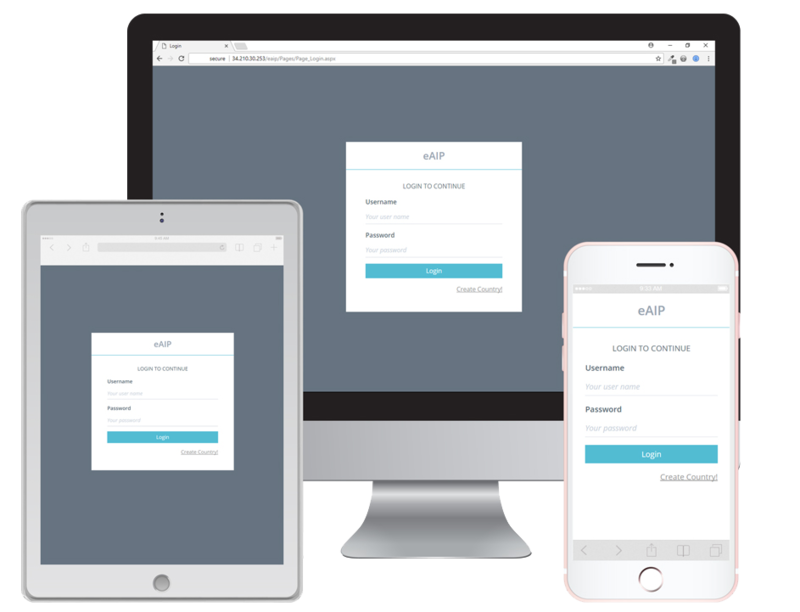 Apart from data integrity it is easy to migrate from existing data sources to the ADL-eAIP solution without any manual efforts. User can easily enter unstructured tabular data. User can enter one additional header and can merge the header columns of added header. Publisher selects the format (HTML, XML) in which he wants to publish the eAIP. After publishing eAIP he may download the published eAIP.